Designed to fit any smartphone with a screen size of 4 to 6 inches. Works on any kind of handlebar with a circumference from 4.4cm (1.73 in) to 10.8cm (4.25 in), like the bike, motorcycle or scooter handlebar but also on strollers or shopping carts. Enabling you to adjust the display to the position most convenient for you, providing you with safe and comfortable while in motion. Super flexible premium silicone absorbs all shocks while offering a firm grip. Never let your phone shake or drop. 10 seconds, Just wrap it around the handlebar, push it through the mount, secure the belt and you're done! NO tool, No screw. If You Meet Any Problems, Please Feel Free To Contact Us, We Will Solve Your Problems Within 24 Hours.  UNIVERSAL DESIGN - Perfect fits all smartphones with screen size from 4.0" to 6.0", including iPhone 5 to iPhone 8 Plus/iPhone X, Samsung Galaxy S8, S7 edge, S6, S5,etc.  HANDLEBAR COMPATIBILITY - Fit for Kinds of Handlebars, Works on any kind of bike, motorcycle or scooter handlebar but also on strollers or shopping carts.  EASY To INSTALL - No screw, no need tool, the silicone belt makes it so easy to attach and detach in seconds. Once tightened, never let your phone shake or drop. 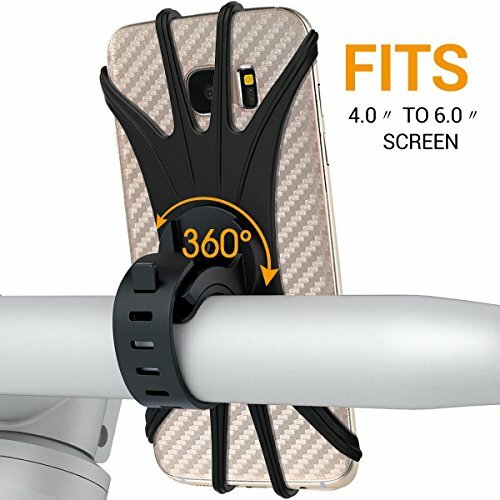  360°ROTATION - Freely adjust your phone to any angle that suits your preference, providing you with maximum convenience in viewing your phone and keeping track of mileage, time or maps during riding. ❤ Quality Customer Service - 30 days 100% Money Back Guarantee and12 months Warranty.If you ever have questions about this product, please feel free to contact our service team. If you have any questions about this product by SNIGJAT, contact us by completing and submitting the form below. If you are looking for a specif part number, please include it with your message.